The agreement with the Ankeny, Iowa-based marketer of post-patent crop protection materials is the culmination of several years of effort to identify a registrant and partner by the California grower-owned organization. It was announced publicly at the Rice Experiment Station's recent Rice Field Day. Although the company is still evaluating the best formulation, Chad Shelton, Albaugh director, global proprietary projects, says it will be low VOC (volatile organic compounds) to meet California requirements. Working with a grower-owned trait is nothing new for the company, either, Shelton says. In fact, ROXY rice will be the company's second herbicide-tolerant crop collaboration. “That's what's really, really cool,” he says. “This was identified and developed by the growers and owned by the growers. And that's a different model” compared to a company-owned trait. “That was a big asset for them as a post-patent company,” he says. Albaugh's first effort involves the CoAXium Wheat Production System and Aggressor herbicide, a collaboration among the Colorado Wheat Research Foundation, Albaugh and Limagrain Cereal Seeds. Grower-funded research by Colorado State University's wheat-breeding program led to two hard winter wheat varieties resistant to Aggressor herbicide, a Group 1 – ACCase herbicide with the active ingredient, quizalofop-P-ethyl. The herbicide trait is owned by Colorado wheat growers, and Albaugh brought the Aggressor herbicide to market. In the case of the ROXY trait, it is property of the grower-owned California Cooperative Rice Research Foundation. The yet-to-be-named oxyfluorfen herbicide will be registered for use only with ROXY rice, Shelton says. Currently, oxyfluorfen is not registered for use in rice in the United States. But it is labeled for weed control on a broad array of crops, including soybeans, corn, cotton, tree fruit, grapes and nuts. A Group 14 PPO inhibitor, the herbicide controls a wide variety of grasses and broadleaf weeds. In rice, it is effective against watergrass, including those biotypes resistant to other modes of action. It also controls several broadleaf weeds, including duck salad. To gain registration on rice, Shelton says, Albaugh will need to conduct residue and tolerance studies and submit the data to the EPA for a Section 3 registration. The California Department of Pesticide Regulation has its own set of data requirements, which Albaugh also will have to meet. Shelton says he hopes the company can seek concurrent state and federal registration reviews. At the earliest, he says, the oxyfluorfen herbicide could be available commercially by 2022. ROXY rice, which stands for “resistant to oxyfluorfen,” was developed by a team led by McKenzie using traditional induced mutagenesis. This technique has been widely used in breeding crops, including the first California semi-dwarf, Calrose 76, as well as M-401, Clearfield and Provisia varieties. Varieties developed using this technique are not considered genetically modified organisms or GMOs. The ROXY trait was discovered in 2014 by Rice Experiment Station breeders. That summer, they identified 29 plants that showed resistance and further testing confirmed nine with oxyfluorfen resistance. Genetic studies at the station determined the herbicide-resistance trait is controlled by a single as recessive gene. That makes it relatively easy to transfer to other varieties. It also means that if ROXY rice outcrossed with red rice, the resistance would not be expressed in the initial outcross progeny. This should reduce the probability of movement of the trait to weedy red rice. During 2015, breeders began purifying the line and transferring the trait to other breeding lines and varieties. 17Y3000, the experimental name of the most advanced ROXY rice line, has been backcrossed to the parent variety M-206. This a common breeding method to “clean up” the original line. They chose M-206 because it is the most widely grown California Calrose medium grain. Dr. Kassim Al-Khatib, University of California, Davis, weed science professor and Cooperative Extension weed specialist, says he applied up to eight times the typical oxyfluorfen rate in trials and it was not lethal. 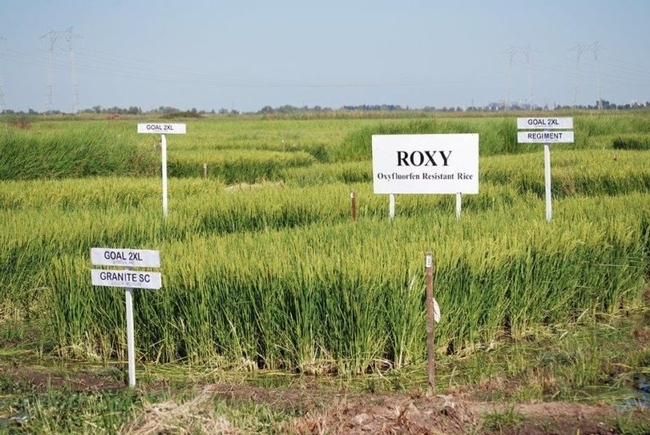 As registration process progresses, Rice Experiment Station breeders will continue to develop improved medium-grain varieties as well as other grain types that contain the ROXY trait. “We want to have very well-adapted California varieties,” McKenzie says. He says they chose to work with oxyfluorfen because it is an off-patent material already used on a number of crops excluding rice. McKenzie envisions growers being able to apply the material to ground that's already been prepared for planting, possibly just behind a roller. Then growers would flood fields and have seed flown into the water, just like they do today. Al-Khatib also is developing herbicide programs for ROXY rice that bring in residuals and other modes of action. He showed off some of those during the recent Rice Field Day. Key to the ROXY system's longevity will be stewardship, Shelton says. “It's a new tool in the grower's tool box, and stewardship is going to be so important to us to make this technology last as long as possible ,” he says. That will include rotating effective herbicide modes of action.